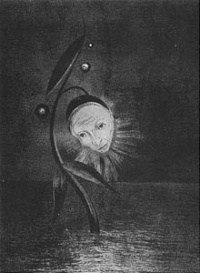 Pierrot is a stock character of the sad clown. Tragicomedy refers to fictional works that blend aspects of the genres of tragedy and comedy. In English literature from Shakespeare's time to the nineteenth century, tragicomedy refers to a serious play with a happy ending. There is no complete formal definition of tragicomedy from the classical age. It appears that Aristotle had something like the Renaissance meaning of the term (that is, a serious action with a happy ending) in mind when, in Poetics, he discusses tragedy with a dual ending. In this respect, a number of Greek and Roman plays, for instance Alcestis, may be called tragicomedies, though without any definite attributes outside of plot. The term itself originates with Plautus: the prologue to Amphitryon uses the term to justify the play's bringing gods into a predominantly bourgeois play. Plautus's comment had an arguably excessive impact on Renaissance aesthetic theory, which had largely transformed Aristotle's comments on drama into a rigid theory. For "rule mongers" (the term is Giordano Bruno's), "mixed" works such as those mentioned above, more recent "romances" such as Orlando Furioso, and even The Odyssey were at best puzzles; at worst, mistakes. Two figures helped to elevate tragicomedy to the status of a regular genre, by which is meant one with its own set of rigid rules. Giovanni Battista Giraldi Cinthio, in the mid-sixteenth century, both argued that the tragedy-with-comic-ending (tragedia de lieto fin) was most appropriate to modern times and produced his own examples of such plays. Even more important was Giovanni Battista Guarini. Guarini's Il Pastor Fido, published in 1590, provoked a fierce critical debate in which Guarini's spirited defense of generic innovation eventually carried the day. Guarini's tragicomedy offered modulated action that never drifted too far either to comedy or tragedy, mannered characters, and a pastoral setting. All three became staples of continental tragicomedy for a century and more. In England, where practice ran ahead of theory, the situation was quite different. In the sixteenth century, "tragicomedy" meant the native sort of romantic play that violated the unities of time, place, and action, that glibly mixed high- and low-born characters, and that presented fantastic actions. These were the features Philip Sidney deplored in his complaint against the "mungrell Tragy-comedie" of the 1580s, and of which Shakespeare's Polonius offers famous testimony: "The best actors in the world, either for tragedy, comedy, history, pastoral, pastoral-comical, historical-pastoral, tragical-historical, tragical-comical-historical-pastoral, scene individable, or poem unlimited: Seneca cannot be too heavy, nor Plautus too light. For the law of writ and the liberty, these are the only men." Some aspects of this romantic impulse remain even in the work of more sophisticated playwrights: Shakespeare's last plays, which may well be called tragicomedies, have often been called romances. By the early Stuart period, some English playwrights had absorbed the lessons of the Guarini controversy. John Fletcher's The Faithful Shepherdess, an adaptation of Guarini's play, was produced in 1608. In the printed edition, Fletcher offered an interesting definition of the term, worth quoting at length: "A tragi-comedie is not so called in respect of mirth and killing, but in respect it wants deaths, which is enough to make it no tragedy, yet brings some neere it, which is inough to make it no comedie." Fletcher's definition focuses primarily on events: a play's genre is determined by whether or not people die in it, and in a secondary way on how close the action comes to a death. But, as Eugene Waith showed, the tragicomedy Fletcher developed in the next decade also had unifying stylistic features: sudden and unexpected revelations, outré plots, distant locales, and a persistent focus on elaborate, artificial rhetoric. Some of Fletcher's contemporaries, notably Philip Massinger and James Shirley, wrote successful and popular tragicomedies. Richard Brome also essayed the form, but with less success. And many of their contemporary writers, ranging from John Ford to Lodowick Carlell to Sir Aston Cockayne, made attempts in the genre. Tragicomedy remained fairly popular up to the closing of the theaters in 1642, and Fletcher's works were popular in the Restoration as well. The old styles were of course cast aside as tastes changed in the eighteenth century; the "tragedy with a happy ending" eventually developed into melodrama, in which form it still flourishes. The more subtle criticism that developed after the Renaissance stressed the thematic and formal aspects of tragicomedy, rather than plot. Gotthold Lessing defined it as a mixture of emotions in which "seriousness stimulates laughter, and pain pleasure." Even more commonly, tragicomedy's affinity with satire and "dark" comedy have suggested a tragicomic impulse in modern absurdist drama. Friedrich Dürrenmatt, the Swiss dramatist, suggested that tragicomedy was the inevitable genre for the twentieth century; he describes his play The Visit (1956) as a tragicomedy. Tragicomedy is a common genre in post-World War II British theatre, with authors as varied as Samuel Beckett, Tom Stoppard, John Arden, Alan Ayckbourn and Harold Pinter writing in this genre. Unless indicated otherwise, the text in this article is either based on Wikipedia article "Tragicomedy" or another language Wikipedia page thereof used under the terms of the GNU Free Documentation License; or on original research by Jahsonic and friends. See Art and Popular Culture's copyright notice. This page was last modified 22:00, 12 October 2014.